The first MLB game of 2017 is in the books. Tomorrow I can watch my team. The Los Angeles Dodgers signed Joel Guzman as an international free agent in 2001. Four years later, Baseball America ranked him as the fifth-best prospect in the game. 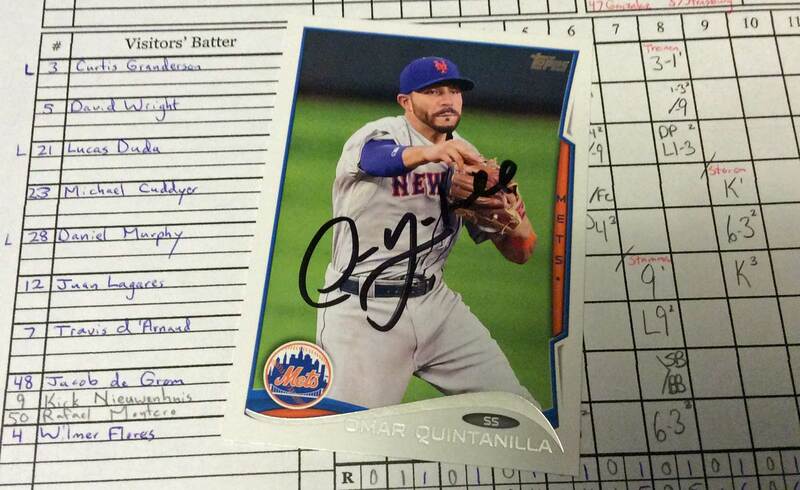 Yesterday’s mail brought a signed baseball card of former New York Mets shortstop Omar Quintanilla. Quintanilla will never be remembered for the stats on the back of his baseball card – he has a .220 lifetime average with 8 home runs and 74 RBI in 402 major league games over nine seasons. Now he did have his moments, with the odd game-winning hit here or there… but on-field accomplishments are only one reason to appreciate a baseball player. When I remember Quintanilla, I will think of the times he signed autographs for fans at Citi Field on days when the “better” players wouldn’t even stop long enough to wave. And I’m not the only one who remembers Quintanilla for his fan-friendly attitude. 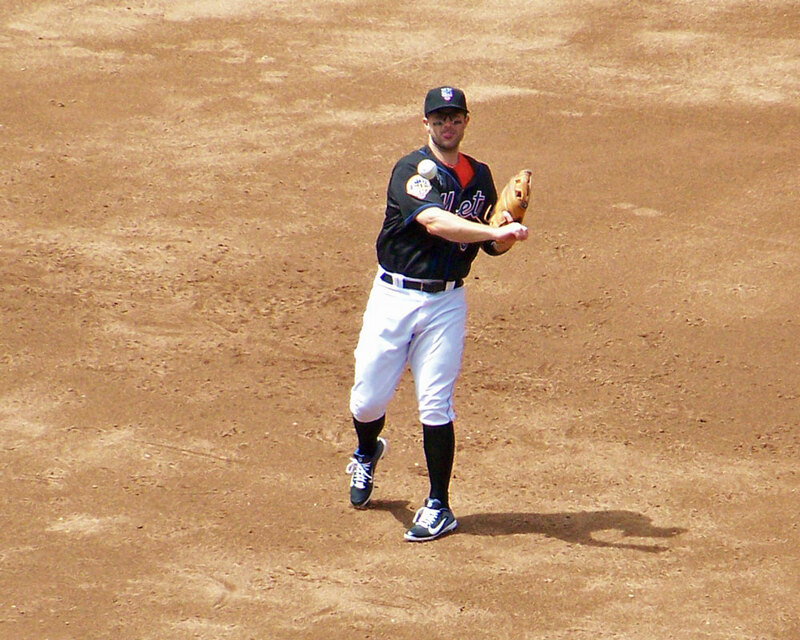 Best of luck to Omar Quintanilla on the Albuquerque Isotopes this year. I got to watch my first full Mets game of the season last night, aided by a timely rain delay that allowed me to get home from a meeting before the first out was recorded. And the Mets cooperated by getting that first loss of 2015 out of the way. There’s been a lot of griping about the batting order Terry Collins has used over the first two games of the season, and I admit it’s not the one I’d write down if I were filling out the lineup cards. I’ll chalk up the lack of offense in the first two games to facing great pitching, but if the struggles continue in Atlanta I’m going to be concerned. I also wasn’t thrilled with the botched rundown play in the bottom of the seventh inning. Sure, it didn’t cost the Mets a run… but it was bad fundamental baseball – what exactly were the Mets working on in Port St. Lucie for the last six weeks? 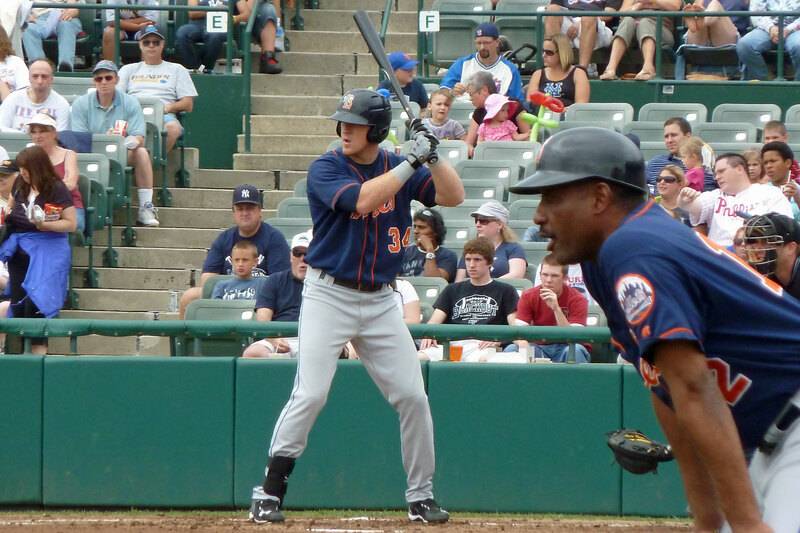 Congratulations to former Mets farmhand Allan Dykstra, who was called up by the Tampa Bay Rays yesterday when 1B James Loney went on the disabled list. Are the Mets making the right call to pass on Maddon? Joe Maddon surprised a lot of people yesterday by exercising his option to get out of the last year of his contract to manage the Tampa Bay Rays. By doing so, he instantly became baseball’s most talked-about free agent. Mets Chief Operating Officer Jeff Wilpon immediately shot down the idea that his team would be pursuing Maddon. As of right now, immediately, it really doesn’t matter what promises Sandy Alderson made to Terry Collins. Because as of right now, immediately, Alderson has it within his grasp to make a move that would be the first legitimate game-changer on his watch as general manager of the Mets. Thomas Coyle is a second baseman in the Tampa Bay Devil Rays farm system. A 16th-round draft pick in 2012, the 23-year-old Pennsylvania native is hitting .249 with five home run, 27 RBI and 22 stolen bases through 92 games for the Charlotte Stone Crabs in the Single-A Florida State League. Coyle could be an interesting sleeper prospect if his offensive numbers improve once he leaves the pitcher-friendly ballparks of the Florida State League behind, or he could find himself trying out for independent league teams in another year or two if they don’t. 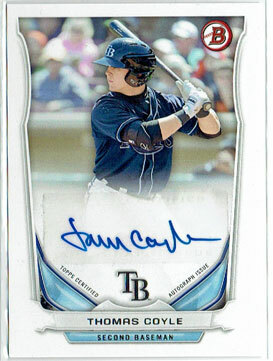 Among younger baseball players, Coyle’s autograph stands out because it is fairly readable. I received this card as part of the prize in @seansa91‘s Twitter contest earlier this summer. The Tampa Bay Rays, a team that at least one prominent baseball writer believes has no long-term future in Florida, nevertheless found the money and will to sign their best player to a contract extension that will pay him an average annual salary of $16.7 million until he’s 36. The New York Mets, who play in the largest media market in the United States, have yet to announce a similar contract extension for their best player. Without being privy to the negotiating process, who can really say whether the fault lies with David Wright and his representation, the finances of the Wilpon family or Sandy Alderson‘s willingness to spend money on baseball players? Alderson is continuing to fill the Las Vegas 51s’ roster (or the Mets’ bench), though. On Monday, the Mets announced that they had purchased the contract of former Atlanta Braves prospect Brandon Hicks from the Oakland Athletics. Hicks, 27, hit .172 with three home runs in 22 games for the A’s last season, appearing primarily as a shortstop…. Spending most of last season at Triple-A Sacramento, he batted .244 with 18 home runs in 328 at-bats there. The Mets also re-signed one of their own free agents, although the move makes little sense to me. Thirty-nine year-old lefty specialist Tim Byrdak has agreed to a minor league deal with New York. He had surgery to repair a torn interior capsule in his left shoulder in September, and is likely to miss at least the first half of the 2013 season. This is the same injury that Johan Santana and Chris Young were trying to come back from this season, with mixed results. I’m not aware of any relief pitchers who have returned from similar injuries, and I question whether Byrdak’s shoulder will be able to hold up to the strain of throwing nearly every day.